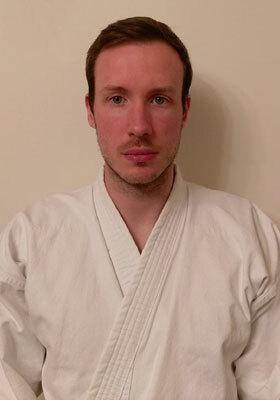 Sensei Cookson - Jacksons Lane Shotokan Karate Club. I started martial arts in secondary school; I was put into boxing and kickboxing classes by my family and told to pick which I preferred. I quickly decided to continue with kickboxing which I studied with NWCKB to purple belt. However to progress further I would have had to go to another class I couldn’t get to at the time so I eventually gave it up. After that I didn’t study martial arts or even exercise until the end of university. The degree I studied was ‘Physiology with Studies in Pharmacology’ and as part of this I was the guinea pig in a fitness experiment. As a result I ended up with a printout stating in exact detail how unfit I was shattering all my illusions to the contrary. I decided that I couldn’t let that stand and started exercising at home. A year later I decided it was time to take up martial arts again. A friend of mine suggested Jeet Kune Do (JKD) the concept Bruce Lee had put forward and I joined the IFC Stockport club in Hazel Grove under John Robins Jr (Sensei Robins’ son). I studied here for over eight years and as well as the JKD classes joined the Filipino Martial Arts class (weapons), the Brazilian Jiu Jitsu classes and the Combined Grappling Arts class. In April 2014 I was awarded my black belt 1st Dan in Jeet Kune Do and the Filipino Martial Arts after an exceptionally gruelling grading that pushed me beyond what I thought I was capable of. In the same year I was also awarded my 1st Dan in Kobudo, a Japanese weapons art. Passing these two gradings was for me a great accomplishment however it quickly became apparent that black belts are nothing more than a target on your back, everyone expects a certain level from you and wants to see what you know. Around this time I took my first steps into teaching. I was asked to teach the Filipino Martial Arts weapons classes under the head instructor’s supervision. After he was satisfied I was often asked to teach the class on my own when he wasn’t available. It was through these classes as both student and instructor that I first met Sensei Robins and Sensei Boothby. Sensei Robins invited me to come along to one of the Jackson’s Lane Karate sessions, I accepted hoping to learn new skills and train in a new way. After assessment within the club I was permitted the grade of purple belt (5th Kyu). I had gained grades in Karate through my training in Kobudo as the two arts have a long association and share some kata. I began training within the club learning the Shotokan forms and structure while expanding my knowledge of techniques. Unfortunately the JKD club I attended closed but I continued training at Jackson’s Lane and in December 2016 after lots of training and practice I attained the rank of Shodan (1st Dan). To me every martial art has something to teach so while continuing my Karate training I have also been trying other arts, including earning a couple of grades in Wing Chun. This in turn helps me understand the possibilities of techniques within Shotokan, though there is always much more to learn!